At a meeting held at CERN this morning, scientists presented the latest results from the search for the long-sought Higgs particle. After 30 years of research and $9 billion of investment, they've changed the face of physics forever: they've found the Higgs boson. "We observe in our data clear signs of a new particle, at the level of 5 sigma, in the mass region around 126 GeV. The outstanding performance of the LHC and ATLAS and the huge efforts of many people have brought us to this exciting stage, but a little more time is needed to prepare these results for publication. "The results are preliminary but the 5 sigma signal at around 125 GeV we're seeing is dramatic. This is indeed a new particle. We know it must be a boson and it's the heaviest boson ever found. The implications are very significant and it is precisely for this reason that we must be extremely diligent in all of our studies and cross-checks." "I am astounded at the amazing speed with which these results have emerged. They are a testament to the expertise of the researchers and the elaborate technologies in place... I never expected this to happen in my lifetime and shall be asking my family to put some champagne in the fridge." The physicists were a little reticent to call the discovery a "Higgs boson", preferring to call it the discovery of a "new boson". That's because they don't yet know its properties – and so can't confirm how similar it is to the Higgs of the standard model. "It's the beginning of a long journey to investigate all the properties of this particle," says Heuer. One property that needs to be investigated is the particle's spin: the standard model says it should have a value of zero; a more exotic boson would give a value of two. Oliver Buchmueller of CMS says the LHC should be able to determine the new boson's spin by the end of 2012. So, there's also plenty more digging to be done to understand the new boson in great detail, too. The future of physics just got exciting. 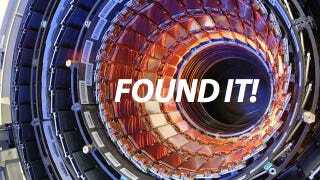 If you still want to know more about the Higgs, watch this video which tells you everything you need to know in under eight minutes.